During the downturn, Gen X homeowners experienced the largest decline in home equity, the difference between what the primary residence is worth and all the debts secured by the home. 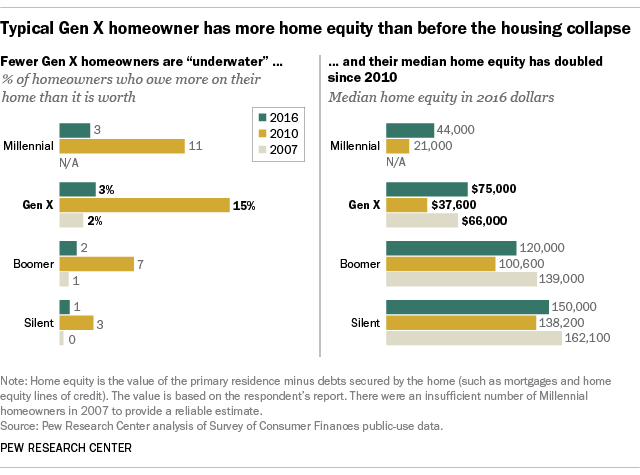 The median home equity of Gen X homeowners fell 43% from 2007 ($66,000) to 2010 ($37,600). Boomer and Silent homeowners had smaller declines in median home equity (28% and 15%, respectively). Stock prices also plunged after 2007, and most households (Millennials being the exception) had declines in financial holdings. The median value of the financial assets owned by Gen X households fell 20% from 2007 to 2010. Typical Boomer and Silent households had modestly larger declines in their financial assets. But while the economic downturn had a disproportionately negative impact on Gen Xers, their fortunes have rebounded more than those of other generations during the post-recession economic expansion and as home and stock prices have risen. Since 2010, the median net worth of Gen X households has risen 115%. In fact, in 2016, the most recent year with available data, the net worth of a typical Gen X household had surpassed what it was in 2007 ($84,200 vs. $63,400). 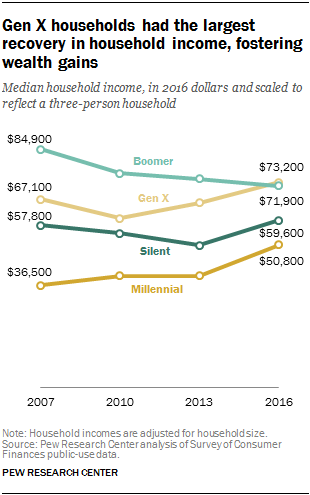 As of 2016, the median wealth of households headed by Boomers and the Silent Generation remains below 2007 levels, though their household wealth still exceeds that of Gen X. The full wealth recovery of households headed by Gen Xers stems from several factors. First, they are the only generation to have recovered the home equity they lost in the downturn. The typical home equity level of Gen X homeowners has doubled since 2010, though this was not achieved without considerable borrower distress. According to Federal Reserve data, 15% of Gen X’s homeowners were “underwater” on their homes in 2010 (meaning they owed more than they owned). By 2016 only 3% were underwater. This improvement is due to lenders foreclosing on homeowners as well as appreciating home values and mortgage modifications. Still, reducing the ranks of homeowners with negative equity in their homes boosts wealth. Gen X households also experienced a stronger recovery in financial assets than Boomer and Silent households. The median financial assets of Gen X households nearly doubled from 2010 ($11,300) to 2016 ($21,600). In comparison, Boomer and Silent households’ financial assets are at a level similar to before the Great Recession. 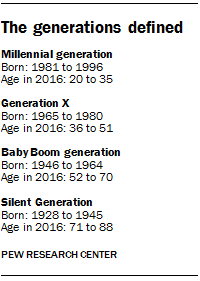 In addition, unlike their older counterparts, Gen Xers are still of prime working age. Higher household income tends to boost wealth because it enables families to save and add to wealth. Gen X’s ability to rebuild its wealth may reflect its relatively robust household income growth since 2010. The median adjusted household income of Gen X households increased more than 20% and, at $73,200 in 2016, surpassed that of other generations. The oldest Gen Xer was 51 as of 2016, meaning that Gen X workers are still approaching their peak earning years. The number of Gen Xers in the labor force has remained stable since 2008, whereas the Boomer and Silent labor force has shrunk through retirements and deaths. Through first-hand experience, Gen Xers learned the painful consequences of economic contractions. At least in terms of wealth, they are now better positioned to weather the next one.